I wanted to make a special ice cream to serve with a plum tart tatin I was making for a dinner party. 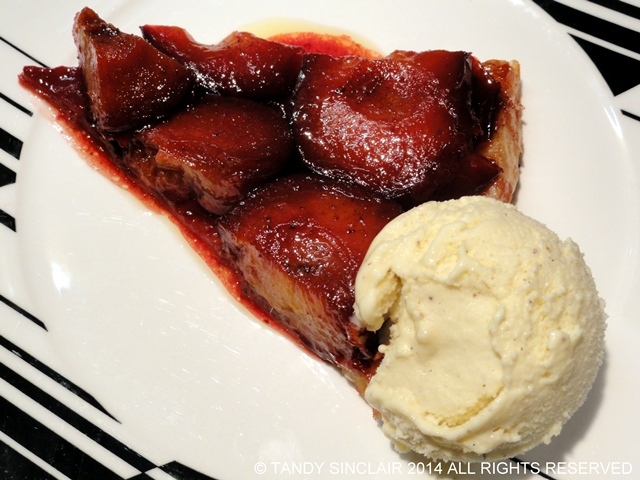 Tart tatin is my go to dessert and ice cream is one of the easiest treats for me to make. This champagne ice cream seemed like the perfect one. I was given a bottle of champagne from Leopard’s Leap and decided to use this for my champagne ice cream. I was telling a friend of mine who is from France about the ice cream and she suggested I use vanilla as the spice for the ice cream. I had some vanilla powder at home, and used this and not vanilla bean for the champagne ice cream. I am sure a vanilla beans would work just as well, and even some cardamom might add an interesting dimension to this champagne ice cream. I will let you experiment! two years ago – I apologize! I made your lovely ice-cream & loved it so much! My husband agreed with me! Oh my goodness! This sounds incredibly decadent. I love champagne and ice cream. How exquisite Tandy, I’ve never tasted champagne ice cream but can imagine it would be lovely! Not keen on ice-cream but could make an exception for this. This sounds terrific! I love making ice cream, and other frozen desserts. While I have made champagne sorbet, I have never used it in ice cream. I bet it was fab. Brava! Wow, I love experimentation such as this! Very clever…Thanks for sharing! Ooo, now this is my kind of ice cream! What a fun infusion into the ice cream! When I saw the title or your post I was “are you serious?” This ice cream just sounds delicious and yes perfect paired with the plum art…awesome dessert! Lovely idea – have made champagne sorbet but neer champagne ice cream! Wow , I have never had bubbly ice cream before. I bet your dinner guest were impressed or at least did not leave until the tart and icecream was inhaled! Tandy, this dessert is just soooo elegent! I can just see myself serving this up at a wedding, how classy and beautiful that would be. What a fun way to toast the new couple. Never tried champagne ice cream, I would love to though. I drink champagne every day! Oh, yes beautiful – Tandy – just my sort of dessert – will put away for the next time I need a special dessert.